10/28 - 11/24: The Druids believed the Reed to be a tree because of its dense system of roots. Cut reeds were used as pens and symbolized wisdom and scholarship. Identified with the submerged or hidden Dryad, the Reed was representative of the mysteries of death. It was associated with being both a saviour and a custodian as well as a symbol of royalty. It was used in the making of instruments such as flutes and pipes. Pan, the Greek God of Herds, Fertility and Male Sexuality (whose name is the root word of "panic"), is often depicted playing a syrinx...a pipe comprised of seven reeds. Traditionally a nomadic people, the Celts camped in one area throughout the Winter months and would break camp in the Spring when the first yellow blooms appeared on the Reed. The Reed was once believed to bring order out of chaos and legend holds that a Reed was thrust into Christ's hand when he was mockingly robed in purple. The Reed grows in silence, thin and slender, by watersides and marshlands, standing in clumps at the edge of rivers. It is representative of arrows that fly up into the unknown air to land at the very source of that which is being sought, symbolic of the direct approach required when confronting a dilemma...whether that dilemma comes from within or without. The Reed expressed the desire to search out basic truths and was also symbolic of music. Within many woodwind instruments, the Reed will create a balance. Even in today's world, the Reed is often used to thatch the roofs of houses, once being representative of the protection it offered to all of Nature's creatures, whether domestic or wild. Weavers often used the Reed to separate the threads they once spun and its leaves were frequently used to fashion baskets and floor mats. Some cultures (such as the Marsh Arabs of the Rivers Tigris and Euphrates) built entire houses and even mosques from Reeds. Natives of the American SouthWest once made arrow shafts from the Reed's woody culms and, in more modern times, small beds of Reeds are sometimes planted to purify domestic sewage. Though often used with great imprecision, the term "Reed" as it applies to the Ogham is the Common Reed or Broom, a giant grass with stems which can grow to be 12 feet tall. It is found in abundance in the British Isles, usually in marshy areas where it often forms dense stands and blooms with yellow pod-shaped flowers. As with most other grasses, the vertical stems of the Reed (which can be very thick and strong) live only for a single year, dying in the Autumn to be replaced with new green shoots in the Spring. The dead stems have a tendency to rattle and whisper in late Autumn winds. The Common Reed has spread in weed-like fashion throughout most of the world but is more widespread in cooler climates. As its alternative name suggests, the branches of the Reed are often dried and used as brooms. A decoction of young branches and seeds was once used to treat malaria, gout and painful joints. Oil drawn from the stems by heating them over an open fire was formerly employed to treat toothache and for the removal of parasites (such as lice). The genus name of the Common Reed (Phragmites) is derived from the Greek meaning "growing in hedges." A member of the Grass family, the Reed offers protection for Ducks during their flightless molting period of late Summer and also serves as a Winter cover for resident wildlife species such as Deer, Pheasants, Foxes, Coyotes and Raccoons. In addition, it creates an excellent nesting site for several non-game marsh birds including the yellow-headed and red-winged Blackbird. The shoots of the Reed are a favored food of Muskrats. There are two distinct types of Reed individuals (a division which relates to all Celtic Tree Signs). The "new moon" character is associated with the first two weeks of a sign and the "full moon" character is associated with the last two weeks. 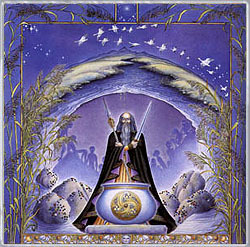 The "new moon" Reed individual make both powerful friends and powerful enemies, given his or her initial response of impatience and impulsiveness. Even so, such people will usually maintain their positions of power and achieve a great deal of respect, particularly from their adversaries. The "full moon" Reed individual plans his or her moves with more sublety and will probably achieve more public recognition. However, such people are inclined to want to move onto other things...an action which can often undermine their true sense of purpose. In general, Reed individuals are imaginative with a clear view of complex matters. They make for powerful friends but can also be powerfully jealous...a jealousy which is prone to turn to violence if not held in careful check. Reed people constantly strive for complete power, both within as well as without. They are wonderful leaders but often fall victim to the "Peter Pan" syndrome. They make for immensely caring and passionate mates as long as their jealous streak can be kept under control. Reed people are usually the catalysts of life rather than the competitors, being more concerned with changing the entire formula of life instead of simply certain aspects. They are known as the great survivors of life but often meet with the hostility of others rather than the offer of a helping hand. It is necessary for Reed individuals to unite a sense of purpose with their strong will in order to prevent a path toward self-destruction. Sometimes referred to as the "Duality of the Ivy," Reed individuals are complex, tenacious and fearless. Proud and independent, they have great strength of character and will rarely compromise, believing they have a role to play which excludes any signs of weakness or the luxury of "sitting on the fence." Reed people are forceful and thrive on challenges, holding an innate belief in their own destiny. Possessed with a powerful presence and a great deal of personal magnetism, Reed individuals attract most people but tend to repel the overly-sensitive. They are never found lacking in the ability to surmount even the most overwhelming odds. Due to their power, however, they must follow a narrow line of virtuous morals. If that line is strayed from, then they can become very dangerous people.